The Futurity First leadership team includes experts in management, marketing, product, sales, finance, technology and compliance. Together, they collectively work to ensure that the company's objectives are achieved, and the needs of our advisors are met. We're not successful unless our advisors are successful - and this collaborative synergy is evident in everything we do, every day we do it. John received his B.S. degree from the University of Nebraska at Omaha and his J.D. from Creighton University. He has served on the Board of Trustees for the American College. He’s a Chartered Life Underwriter (CLU), a Chartered Financial Consultant (ChFC), and a member of the Society of Financial Service Professionals (SFSP), the Nebraska State Bar Association and the General Agent and Managers Association (GAMA). He also holds his series 6, 63 and 26 licenses. 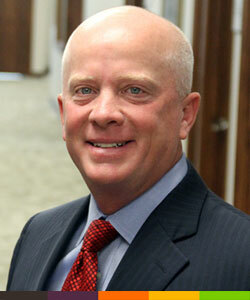 Curtis has more than 19 years of experience in the insurance industry. Prior to joining Futurity First, Curtis was a regional director at Bankers Life and Casualty Company, where he oversaw a region of branch offices in the Northwest while managing a branch office that averaged 20% annual growth rate during his 10 full years at the helm. He also served as the Field Chairman of the Compliance Committee, and was the field representative on Conseco’s Compliance Committee.